Layer all ingredients for the soup on top of one another. 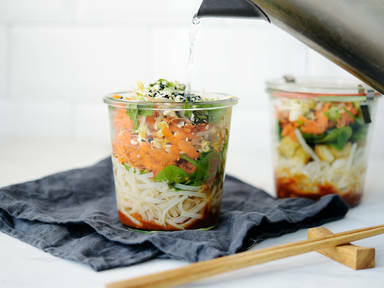 Start with precooked rice noodles, then add fried diced tofu, baby spinach, grated carrot, green onion, bean sprouts, and mint, and top with white and black sesame. Seal carefully. Before serving, fill up the mason jar with hot water and let rest for approx. 5 min. Then stir carefully before eating to mix sauce, noodles and vegetables. Enjoy!